Become a member of our multidisciplinary team of physicians and scientists focused on our Mission � to contribute to the prevention and cure of cancer. You should be board certified in Anatomic Pathology and Molecular Pathology with experience in a multi-disciplinary university clinical setting. Licensure or eligibility in the State of Florida required. The position will include 30% administrative time for establishing, supervising, and directing the Anatomic Pathology Molecular Laboratory, and 70% service time for the signing out of all of the molecular tests performed in the Anatomic Pathology Molecular Laboratory. Join our team and receive rewards including a competitive salary, an outstanding lifestyle benefit package and all that Tampa Bay has to offer � picturesque Gulf beaches, family-friendly attractions, professional sports teams, cultural events, and no state income tax! (1) We have updated the numerous Carcinoma topics in the Breast-malignant chapter with our new format that has thumbnails and better formatting. Thanks to Geoffrey A. Talmon, M.D., University of Nebraska Medical Center, Omaha, Nebraska (USA), for contributing this case and the discussion. To contribute a Case of the Week, email khpathology@gmail.com with the clinical history and your diagnosis.� Please also email us diagnostic microscopic images (textbook quality) in JPG, GIF or TIFF format (send as attachments, we will shrink if necessary), and include any other images (gross, immunostains, etc.) that may be helpful or interesting.� We will write the discussion (unless you want to), list you as the contributor, and send you $35 (US dollars) by check or PayPal for your time after we post the case. Please only send cases with high quality images and a diagnosis that is somewhat unusual (or a case with unusual features). The resected nerve had a 2.0 cm fusiform dilation near one end.� The cut surfaces of the dilated portion were vaguely encapsulated, white and laminated with interposed yellow adipose tissue. Lipomatosis of nerve (LN) is a benign lesion consisting of infiltration of nerve bundles by collagen and mature adipose tissue.� It is also known as fibrolipomatous hamartoma, macrodystrophia lipomatosa and neural fibrolipoma.� It was first described in 1952, and is considered a hamartomatous lesion without any syndromic association (Fletcher: Pathology and Genetics of Tumours of Soft Tissue and Bone (WHO, Vol 5), 2002). 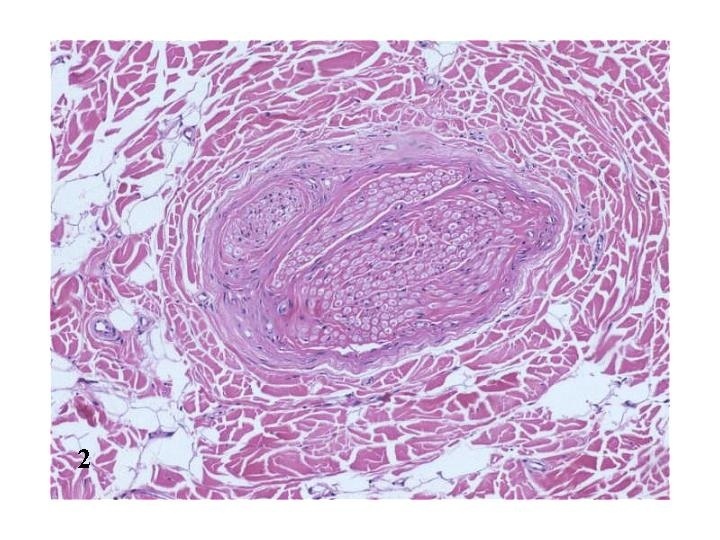 Lipomatosis of nerve may be noted at birth, but typically presents at ages 11 to 39 years with no history of antecedent trauma.� For unclear reasons, it has a predilection for the median and less frequently, the ulnar nerves (Histopathology 1994;24:391), although cases have been seen in the toes, cranial nerves and brachial plexus. It commonly presents as an asymptomatic or gradually enlarging, painless mass.� It may be associated with distal sensory or motor deficits if compression atrophy occurs, and is part of the differential diagnosis for carpal tunnel syndrome.� One-third of cases are associated with macrodactyly of the digit innervated by the affected nerve, a finding that is more common in females.� A case of bilateral LN has been reported (Muscle Nerve 1998;21:656). The appearance of LN by magnetic resonance is pathognomonic.� T1 weighted images reveal a fatty mass that is evenly distributed between nerve bundles and seen running along individual nerves.� It is often described as having a �coaxial cable-like� appearance on axial scans (Acta Radiol 2003;44:326). 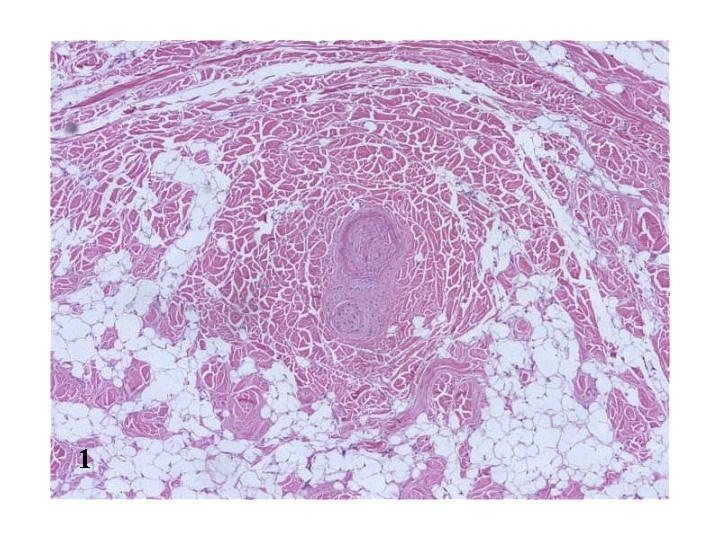 Histologically, the mass is composed of a proliferation of mature adipose tissue and collagen that is confined by the epineurium and separates nerve bundles.� Laminated perineural fibrosis, septation of the nerve fascicles, and pseudo-onion bulb formation are also described as salient features.� Occasionally, metaplastic bone is seen. The differential diagnosis includes other fatty lesions affecting the nerve, notably intraneural lipomas, traumatic neuromas and diffuse lipomatosis.� Intraneural lipomas are characterized by fatty tissue that displaces nerve bundles, but does not separate them.� Traumatic neuromas have onion bulb formation, but usually lack concentric perineural fibrosis, and have a high T2 signal density on magnetic resonance imaging.� Diffuse lipomatosis is not confined to the epineurium. As a hamartoma, lipomatosis of nerve has benign behavior.� Treatment is somewhat controversial (J Neurosurg 1998;89:683), ranging from excision (which many consider the mainstay of therapy) to simple division of the transverse carpal ligament to relieve symptoms.� Excision often requires the sacrifice of the involved nerve.� Recurrence due to incomplete resection occurs in 33-60% of cases.